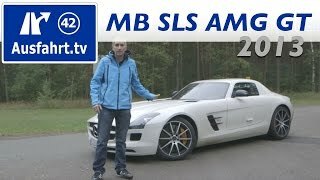 The Mercedes Benz SLS AMG has been a tremendous success ever since it's been unveiled back in 2009, and since then it has been considered the spiritual successor of the legendary 300SL Gullwing. This year Mercedes-AMG plans on launching a new, redesigned model of the SLS dubbed the Mercedes SLS AMG GT. It boasts more power, better race track performance and enhanced driving dynamics. Under its hood the GT 2013 comes with the same hand-built 6.2 liter V8 normally-aspired engine that is to be found on the ongoing SLS AMG. However, unlike the current model the upcoming model boasts 591 horsepower. The amount of torque remains the same and is rated at 479 lb-ft. The V8 engine is mated with an AMG-developed 7-speed dual-clutchSpeedShift gearbox which sends the power to the back wheels. However the gearbox that is to be found in the 2013 model has been tweaked and Mercedes claims that it will now be much more responsive in manual mode. That being said we can expect the GT to go from 0 to 60 mph in just 3.6 seconds (0.1 seconds faster than the ongoing model) while having an electronically limited top speed of 198 mph. Fuel efficiency isn't really the primary factor you're eager to hear about when it comes to a SLS AMG, but the automaker has rated the new GT at 14 mpg city and 20 mpg highway. Furthermore the new 2013 model will benefit from AMG's Ride Control Performance suspension system which will give the car a more sportier ride, improving the handling drastically. On the exterior there aren't many changes compared to the ongoing model and the only notable changes are a pair of darker headlights, a new set of 20 inch wheels, red brake calipers, glossy black finishes on side mirror housing and fender strakes, and evidently some GT emblems. On the interior the upcoming model comes with additional glossy black elements on the door panels and center console, red seat-belts and floormats, but most importantly a new AMG Performance steering wheel featuring Alcantara finishes and metal inserts. The Mercedes Benz SLS AMG GT 2013 will be available both as a coupe and convertible and is expected to hit the US market starting November. The German carmaker has not revealed any information regarding the price, but more information regarding the matter will become available once we'll get closer to the launch date. Overall, not much has changed so we're expecting this year's model to compete with its older rivals, the Ferrari 458 Italia, the McLaren MP4-12C and the Audi R8 just to name a few.